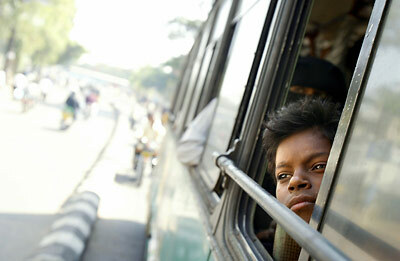 "A new hope" Srinu, 10, looks out of the bus as he rides from Secunderabad to the Child Line call center in Hyderabad. Child Line is a toll free hotline where people call in to report abandoned children, street kids and children in need. A volunteer found Srinu at the train station where he had been living for the past five days. Srinu's mother died last year and then his father died a few weeks ago leaving Srinu with no family and no home. Srinu will go and live at a transitional home run by a private charity but will not have a chance to go to an orphanage or be adopted.